Here are some snazzy birthday facts about 10th of October 1992 that no one tells you about. Don’t wait a minute longer and jump in using the content links below. Average read time of 10 minutes. Enjoy! What day was my birthday Oct 10, 1992? October 10, 1992 was a Saturday and it was the 284th day of the year 1992. It was the 41st Saturday of that year. The next time you can reuse your old 1992 calendar will be in 2020. Both calendars will be exactly the same! This is assuming you are not interested in the dates for Easter and other irregular holidays that are based on a lunisolar calendar. There are 171 days left before your next birthday. You will be 27 years old when that day comes. There have been 9,690 days from the day you were born up to today. If you’ve been sleeping 8 hours daily since birth, then you have slept a total of 3,230 days or 8.84 years. You spent 33% of your life sleeping. Since night and day always follow each other, there were precisely 329 full moons after you were born up to this day. How many of them did you see? The next full moon that you can see will be on May 18 at 21:13:00 GMT – Saturday. Fun stat: Your first one billion seconds (1,000,000,000) will happen sometime on June 18, 2024. If a dog named Blankie - a Bearded Collie breed, was born on the same date as you then it will be 137 dog years old today. A dog’s first human year is equal to 15 dog years. Dogs age differently depending on breed and size. When you reach the age of 6 Blankie will be 42 dog years old. From that point forward a medium-sized dog like Blankie will age 4.5 dog years for every human year. Over 600 papal troops land at Dún an Óir, Ireland to support a rebellion. In a treaty with the Dutch colonial authorities, the Ndyuka people of Suriname – descended from escaped slaves – gain territorial autonomy. United Airlines Boeing 247 mid-air explosion: A United Airlines Boeing 247 is destroyed by sabotage, the first such proven case in the history of commercial aviation. The Outer Space Treaty, signed on January 27 by more than sixty nations, comes into force. A magnitude 7.3 earthquake occurs in the Algerian town of El Asnam. Around 3,500 die and 300,000 are left homeless. FMLN is founded in El Salvador. What does my birthday October 10, 1992 mean? Your birthday numbers 10, 10, and 1992 reveal that your Life Path number is 5. It represents progress, adventure and opportunity. You possess the curiosity of a cat and long to experience all of life. The following celebrities also have the same life path number: Joan Fontaine, Joanie Sommers, Clive Barker, Max Thieriot, Agathonas Iakovidis, Donald "Duck" Dunn, Frank Caliendo, Chanel Iman, Denis Dallan, Theo Maassen. 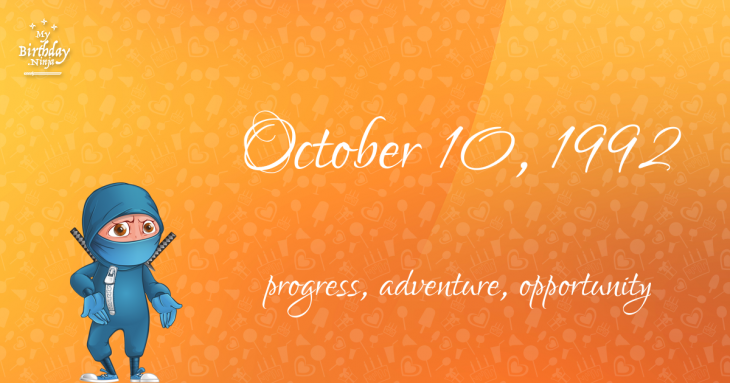 What is the birthday horoscope for Oct 10, 1992? The Western zodiac or sun sign of a person born on October 10 is Libra ♎ (The Scales) – a cardinal sign with Air as Western element. The ruling planet is Venus – the planet of love and beauty. According to the ancient art of Chinese astrology (or Eastern zodiac), Monkey is the mythical animal and Water is the Eastern element of a person born on October 10, 1992. Fun fact: The birth flower for 10th October 1992 is Cosmos for constancy. The number-one hit song in the U.S. at the day of your birth was End of the Road by Boyz II Men as compiled by Billboard Hot 100 (October 10, 1992). Ask your parents if they know this popular song. How many babies were born on October 10, 1992? Base on the data published by the United Nations Population Division, an estimated 135,687,063 babies were born throughout the world in the year 1992. The estimated number of babies born on 10th October 1992 is 370,730. That’s equivalent to 257 babies every minute. Try to imagine if all of them are crying at the same time. What is the popular baby name on 10 Oct 1992? Here’s a quick list of all the fun birthday facts about October 10, 1992. Celebrities, famous birthdays, historical events, and past life were excluded. 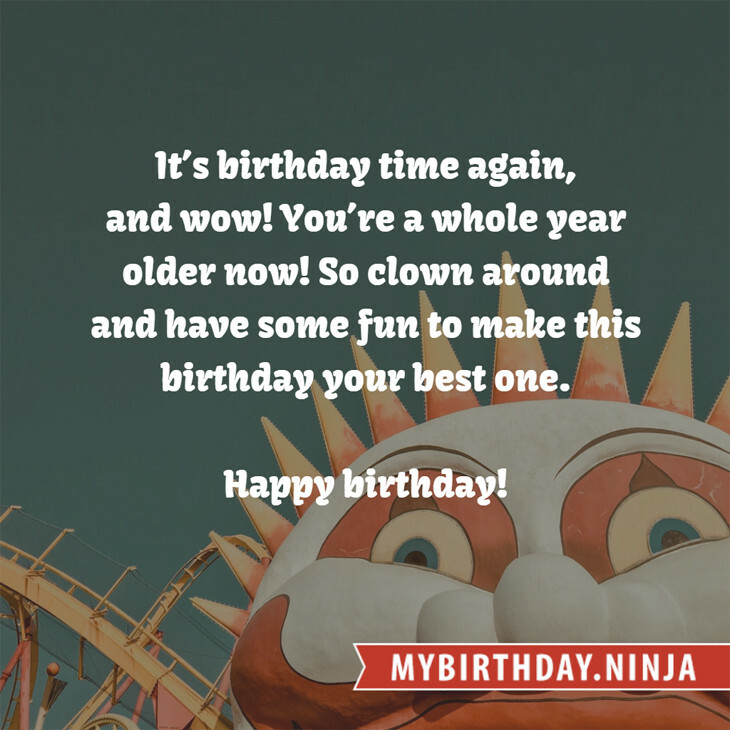 Try another birth date of someone you know or try the birthday of these celebrities: April 30, 1956 – Jorge Chaminé, Portuguese opera singer; May 28, 1964 – Zsa Zsa Padilla, Filipino singer and actress (Hotdog); December 26, 1938 – Alamgir Kabir, Bangladeshi director, producer, and screenwriter (d. 1989).